Facebook recently opened a headquarters in the northern California city. People who lived in Menlo Park, California, in the 1950s and 1960s reminisce about places like the first Round Table Pizza, Joe Prein's Music Store, and Jiffy Burger—small, entrepreneurial businesses. Today much of the talk centers around the Frank Gehry-designed, 430,000-square-foot Facebook headquarters, which opened in the city at the south end of San Francisco Bay this year. About 2,800 employees work there, according to news reports. Facebook's workforce is made up of many Millennials, a generation that wants to live and socialize in the area where they work. Anticipating enormous growth, the company continues to plan for more office space for its employees. And the people who work for Facebook also need homes and services. Due to the growth of Facebook and other tech companies in the area, Menlo Park city planners face the challenge of managing the housing plan for the tech workers moving into the city without spoiling the charm of the community (pop. 33,000). In the Bay Area, housing is at a premium. Water is a concern too. How will the Menlo Park community maintain the character of the city it cherishes while accommodating accelerated growth? Geodesign is helping answer this question and others that relate to Menlo Park's growth, offering design options as the city works to build a sustainable community of the future. Geodesign is a design framework supported by geographic science powered by technologies such as GIS. Menlo Park hired the California-based community planning and urban design company PlaceWorks to analyze questions related to the city's land use and development. 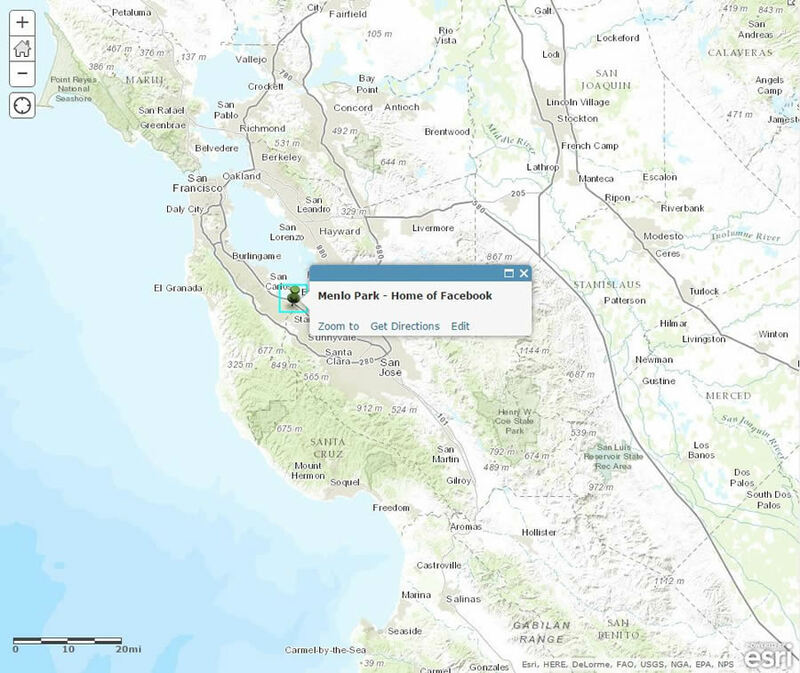 The firm, an Esri partner, decided to use the geodesign tools in the Esri app GeoPlanner for ArcGIS for analyses and got Menlo Park decision makers and other stakeholders involved in the process, too. The app enabled the city planners to evaluate the impacts of development, envision scenarios of how the city would grow, and provide input for informed policy decisions. GeoPlanner for ArcGIS is a web-based app that helps users make location-driven decisions about land use, natural resource conservation, forestry management, and landscape architecture. From creating projects and managing data to evaluating scenarios and preparing reports, the planning process can be managed more efficiently in this one app. Menlo Park staff used Esri's GeoPlanner for ArcGIS to evaluate the impacts of development driven by job growth in the city. "We chose GeoPlanner to allow Menlo Park staff, stakeholders, and decision makers to play with the data and see different alternatives," said Robert Kain, PlaceWorks GIS manager. "With GeoPlanner for ArcGIS, they don't need any GIS experience. 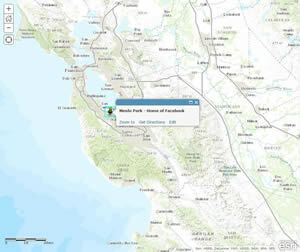 Esri designers made the product easy and intuitive, so anyone can use it. GeoPlanner comes with a built-in library and a multitude of context-appropriate landscape layers that are easy to add into your analysis." PlaceWorks consultants met with community leaders, reviewing the city's general plan and discussing their concerns. City planners needed to know how land-use changes and potential new development would impact transportation, water consumption, job creation, and city revenue. PlaceWorks mapped constraints on growth and analyzed how an increase in population would affect the city. The firm also weighted the city's performance indicators in traffic, jobs, and water use and the impact on tax revenues. Planners and community members were able to use these outcomes to evaluate and compare the impacts of growth and see where there was a need for more infrastructure, services, and housing. Although the measurement tools in GeoPlanner for ArcGIS seem simple to a GIS expert, their underlying complexity has been appreciated by the planners working in Menlo Park. Users remarked on how easy it was to see land area, measure the distances between areas, and calculate drive times. "That's the power of GeoPlanner," Kain noted. "It doesn't need to do everything, but it can do many things. People quickly pick it up and get going. When people are able to use the tool to do alternative planning, they seem to take greater ownership in the project. Further, we can make GeoPlanner available on the Internet so that the public can also look at the data and play with it. This way people feel involved." GeoPlanner for ArcGIS comes with dashboards that help users compare design alternatives. These dashboards help planners visualize existing land-use conditions and the number of residences in the city. Planners can create geospatial scenarios for their various ideas, see how these would modify land-use features, and estimate the costs and benefits of the proposed development. For example, PlaceWorks used the app to create a model based on standardized rates of water consumption to come up with metrics related to water use. Population numbers were entered and the model run, displaying the areas on a map where and by how much water demand would change. California has been in a drought for several years. Water allocated to cities is based on anticipated population growth. Scientific analyses presented in a geospatial context assist with ever more important water rights negotiations. Dashboards created with GeoPlanner for ArcGIS help urban designers quickly query data and create scenarios to understand the effect of their concepts. Any city's design needs—whether adding development, establishing a response system, or managing sea level rise—can be configured into GeoPlanner for ArcGIS. Because GeoPlanner for ArcGIS is part of the Esri ArcGIS platform, it can be integrated into products such as Esri Maps for Office and ArcGIS Online. "GeoPlanner made it possible for anyone with Internet access to compare the potential effects of future growth," said Charlie Knox, a principal for PlaceWorks who worked on the Menlo Park project. "People [from the city] have been able to comment in a meaningful way. City officials could incorporate [that feedback] into their decision making. In this way, GeoPlanner provided a valuable tool for building community consensus."